Conceptual design, community collaboration, design development, and bid documents for all environmental graphics elements for this new neighborhood park and trailhead for the Bruce Vento Regional Trail. 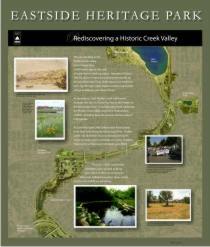 The project included design of trail maps and historic interpretive graphics. Client: Thorbeck Architects, Minneapolis and the City of Saint Paul, Minnesota. The park was funded with both State and Federal funds and was coordinated with and reviewed by the Minnesota Department of Transportation. Award: Saint Paul Heritage Preservation Commission and Saint Paul Chapter of the American Institute of Architects, Award of Recognition, for design of interpretive graphics and signage, May, 2010.